Penguin's periscope from his sinister submarine in Batman. (TCF, 1966) This fantastic piece features a comical penguin head surmounted atop a thick black wooden pole, used in the production as a periscope by the Penguin, Batman's arch-enemy. Painted black with an orange beak and white facial features, the periscope measures 50 in. tall. 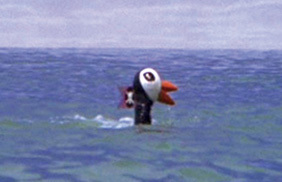 A distinctive piece used in the film version based on the classic TV series.